• Fashion show hosted by co-founders of FUBU. FB For The Culture will present a dynamic fashion panel introducing 10 international Black-owned clothing brands. Hear from the two co-founders of the Global brand FUBU, Carl Brown and Jay Alexander and ways we need to own and control our culture. • Business Workshops: Hear from Black manufacturers and top business moguls. • Main Stage panel discussions with top business moguls and leading experts. B2B Speed Consulting: Receive free advice and consultation from professionals at our B2B speed consulting hosted by HBCU Wall Street. Bring your children so they can meet the authors of their favorite Black books, jump in the bounce houses, get their face painted, meet their favorite Black cartoon mascots like Bino and Fino and much more at the Children’s Corner. WeBuyBlack.com is the largest online marketplace where Black-owned businesses may create a shop and sell their products to the world. Our goal is to help circulate majority of our $1.3 trillion spending power within our own community. The weekend will be packed with human excellence and we need all supporters to show up and show out! If you are serious about supporting the Black community and ensuring that our next generations are set on an equal playing field with the world, the We Buy Black Convention is a “must attend” event for you. 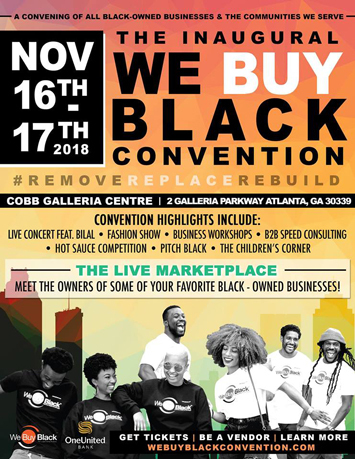 The convention is Nov. 16-17 at Cobb Galleria Centre, 2 Galleria Parkway Southeast in Atlanta, Ga. 30339 from 9 a.m. – 10 p.m. For more information including ticket prices and vending opportunities, visit www.webuyblack.com.